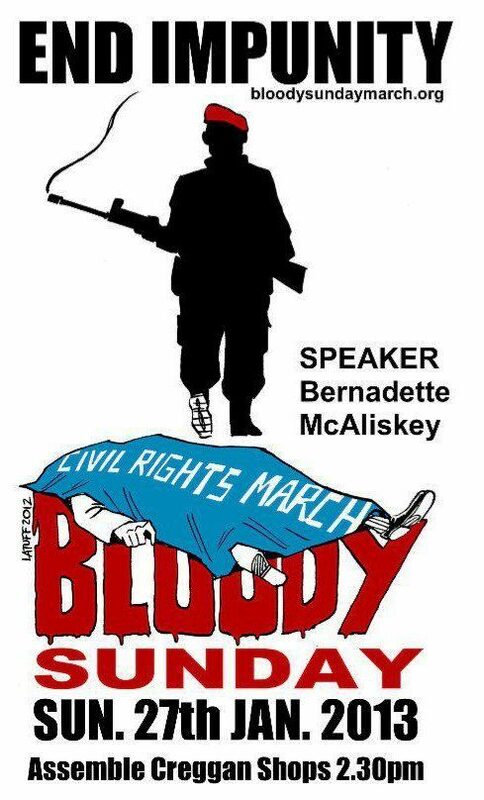 This year's annual Bloody Sunday's March for Justice takes place this weekend in Derry. This years programme of events has a host of discussions, movies, drama as well as the annual march and rally which takes place on the Sunday afternoon. Anarchists in Derry will once again gather for the march and will be joined by other friends and supporters across the country. The Ireland segments of a European speaking tour with an Anarchist from Moscow who will talk about the anarchist movement in Russia, its successes and failures. Antti Rautiainen lived in Moscow for 13 years, participating in anarchist activities. His residence permit was revoked in March of this year, allegedly because he "called for a violent overthrow of constitutional order, or otherwise endangered the safety of Russian Federation or its citizens". 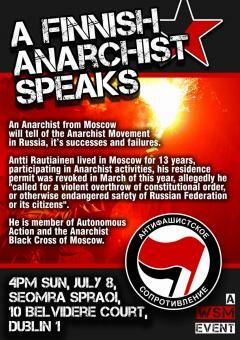 He is member of Autonomous Action and the Anarchist Black Cross of Moscow. Cork on Sat July 7th, 5pm at Solidarity Books, Douglas St.
Issue 5 of the Irish Anarchist Review will be coming out in time for the Dublin anarchist bookfair. If your coming to the bookfair why not book multiple copies of this excellent publication to take away with you and give to friends or drop off in your local social center or other radical space. If your able to do this use our Contact us form to let us know how many you'd like to pick up at the bookfair. Please include a phone number so we can confirm this with you the night before and so avoid unnecessary carrying of bundles to the bookfair. On Saturday the 4th of February, there is a protest against SOPA (Stop Online Piracy Act) and ACTA (Anti-Counterfeiting Trade Agreement) legislation being implemented. 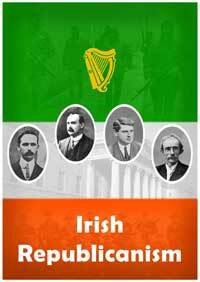 People will meet at 1:00pm at the Gardens of Remembrance, Parnell Square, Dublin. 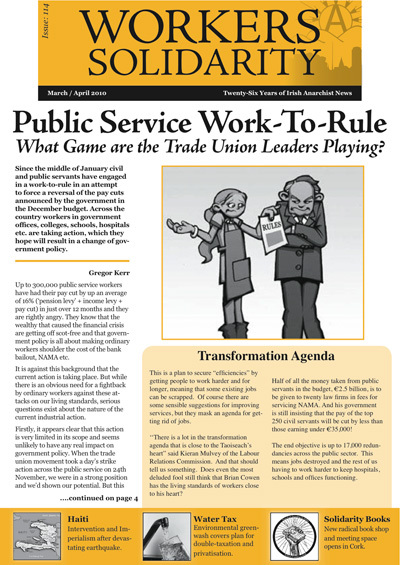 After some months of preparation the Workers Solidarity Movement is launching our supporter program. 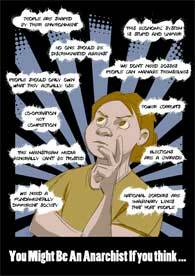 We started working on this after debate at our Spring conference around the fact that there are many people who broadly agree with our political positions and the organising we do but for one reason or another are not yet looking to become members. We decided to launch our Supporter program so that such people could have ongoing formal relationship with the WSM that would involve some participation in internal discussion, helping us out financially and working with us in areas of activity they have a particular interest in when they have time. With members we expect a commitment to a minimum level of such activity, but we are not expecting the same from supporters rather we hope they will help us out when they are able. 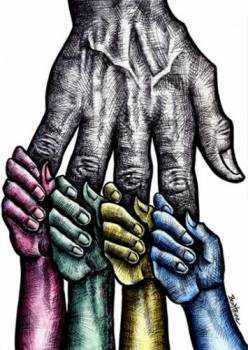 The editorial group for Irish Anarchist Review 3 are seeking a volunteer to produce the cover art for Issue 3 on the theme 'imagining the future' in a positive and pro-revolutionary sense (i.e. not a dystopia!). 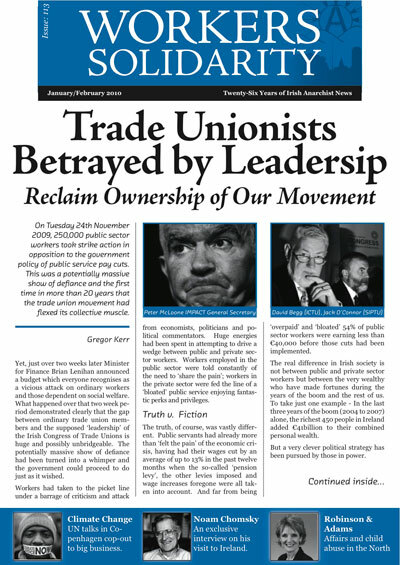 3,000+ copies of the issue will be printed to be distributed at the Dublin anarchist bookfair and other nodes. In the last week of February two WSM members travelled to London to take part in the second conference of Anarkismo organisations in Europe. 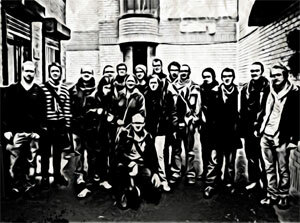 Anarkismo is a global network of anarchist organisations united around the Anarkismo.net website, the Anarkismo statement and the Anarchist Black Cat discussion forums. WSM sees Anarkismo.net as the centre of our international work. 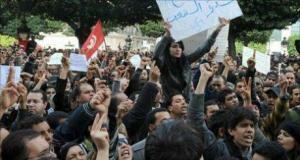 The WSM has signed this international anarchist statement of solidarity with the revolt in Tunisia published by Anarkismo.net. "Our organizations affirm their full solidarity with the struggle of the Tunisian people for freedom and social justice and our support for militant anti-capitalist Tunisians. We condemn the attitude of the Western States and more generally their political classes, both right-wing and social democratic, who have always actively supported the authoritarian power of Ben Ali." In recent weeks, the signs of anger among the peoples of Europe have been increasing: a general strike in Portugal, the huge September 29 strike in Spain, demonstrations of historic proportions in Ireland, the student movement in England, the enormous protests in Italy by factory workers and students and the growing mass movement against the privatization of water and, hopefully, the beginning of a lasting movement following the mobilizations over pension reforms in France. 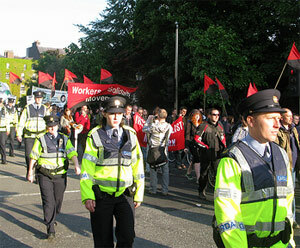 Though the slogans may vary from one country to the next, the revolt has the same origin: the peoples' refusal to pay for a crisis they did not cause, to have to put up with austerity measures by themselves, without the capitalists having to pay.The case of Ireland is emblematic - reduced social benefits, staff cuts in the public sector and cuts to public sector workers' pay, the extension of income tax to those who do not currently pay, the lowest-paid workers. But the government is not touching corporate tax, however, one of the lowest in Europe. 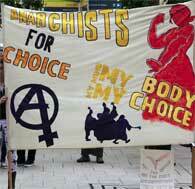 The Irish people are refusing to bow down and tens of thousands of protesters took to the streets in late November. The WSM is one of 108 organisations internationally that has signed a statement in support of today's general strike in the Spanish state. Spain like Ireland is one of the countries where the capitalist crisis is hitting the working class hardest, unemployment has reached 20%, but in Spain unlike Ireland large sections of the working class are organising to resist the crisis. 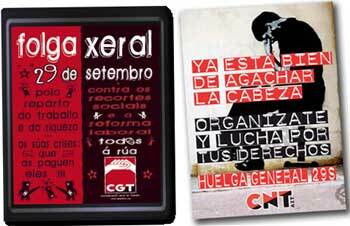 Spain has a long history of militant anarchist unions, this statement was prepared by one of them, the CGT, in opposition to the partnership approach taken by most of the unions. 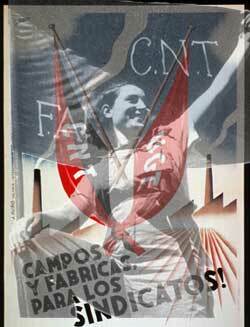 It's is preceeded by an analysis by Manu García, a member of another of the unions, the CNT, about the importance of today's general strike.